I've been watching these guys grow from tiny to HUGE all year; all the time wondering what in the world they're going to taste like, and worrying if they'd even have tubers since they never quite flowered. There were plenty of reasons to be worried. They were planted in a terrible location with only a few hours of morning sun, under an oak tree. 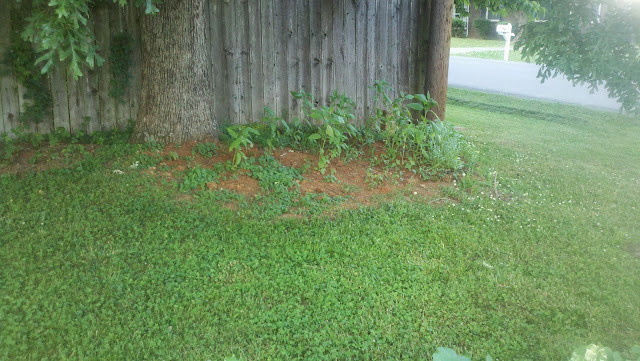 The bed itself took form by accident as it was just a place to pile sod while I double-dug my garden beds. The clay soil wasn't even improved with peat moss, manure, or even yard wastes! 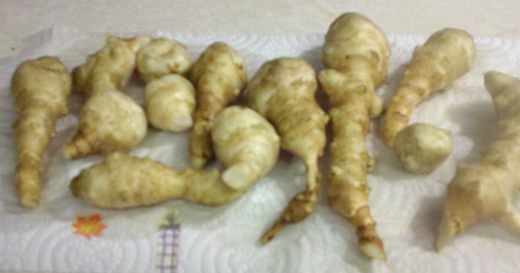 But tonight, after the first frosts have rolled through, I took a flashlight and dug up the little alien-looking things. Yum right? I just about bailed on the whole project, but that was a lot of work to give up before the first try. So I scrubbed them with a vegetable brush and cut off the little bumps. They take on the color of your soil, so mine have a faint reddish tinge to them from the clay. Honestly I didn't much care for them raw. They have a pleasant crunch to them, like a raw potato, and I could see how they'd be good shredded into a salad. Instead I opted to slice them thin (less than 1/4 of an inch) into little chips, and simply sautee them for about 5 minutes in butter and salt. After which time they looked exactly like potatoes. They tasted much like potatoes, right down to that buttery soft baked potato texture. You could cook them a little less, or cut them a little thicker than I did to keep some of that crunch. But they have a fantastic nutty flavor that makes potatoes seem incredibly bland by comparison. I absolutely love these!! Storing them for the winter couldn't be more simple. You chop the stalks down (into foot long sections and drop in place for added soil build-up), and then just leave them right in the ground. They will not spoil all winter long. Dig up however many you need for that day, and drop two or three back into the hole for next year's crop. Fortunately, in addition to tasting good, being easy to grow, and storing well; they're full of great nutrition and health benefits. While they have a high starch profile, much of it is made up of insoluble fiber, including inulin (not the nasty stuff they add to processed foods instead of sugar and fat but the good stuff). It has a documented stabilizing affect on blood sugar. So much so that it is being actively investigated as a method to help stabilize diabetes (why not just eat the stuff?). 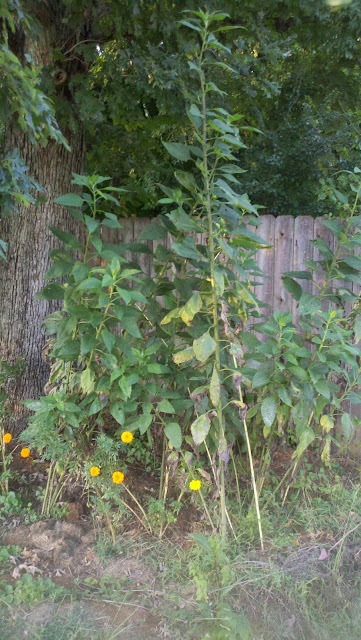 So now the only hard part left is to figure out where else these giant sunflower like crops will fit in my yard!